Once again I find myself feeling fortunate to live in the Great Lakes region. While California dries up to a dust bowl level or worse, it’s easy to feel smug for conserving water where I am. But then I realize – my own water-saving techniques would be a drop in the bucket in Southern California (pun unintended, sort of). As soon as our new garage is built, I’ll set up the rain barrels to catch and collect rain water. Those rain barrels are wonderful. I have two, and they provide enough water to keep my garden growing. If I’m honest, however, these two big barrels collect enough water in a typical year. The south west region of the U.S. has had several years in a row that were anything but typical. A rain barrel is only good when rain falls. I was feeling virtuous for reusing sink water. After washing a few dishes, I scooped up the soapy water and watered my tomato and pepper seedlings. Plants seem to thrive with this not-quite-pristine water. But then again – my water bills are fairly low because, well, because we live in the Great Lakes basin. There’s a lot of fresh water to go around. Even this sink full of the valuable liquid would boost my water bill in the hot sun of SoCal. And that takes me back to an incident that soaked our front yard until it felt like a sponge or quicksand: the Water-Gas Leak Disaster. 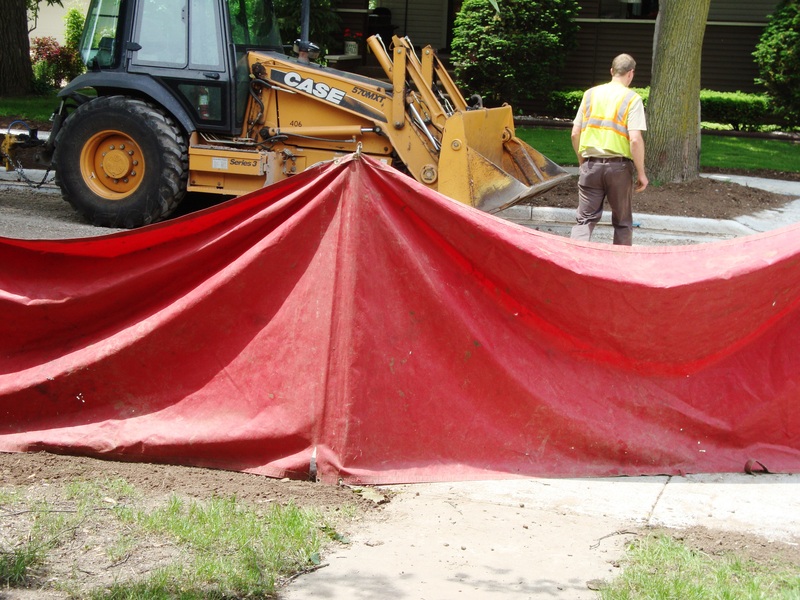 When an irresponsible worker drove a bobcat over the curb stop that directs water from the main into our home, that break flowed into the ground until it could hold no more. Then it sent gallons and gallons into our basement. The rest is history – bad memories, to be sure, but history. I remember talking to a man from the water department who explained the damage to me. I reacted with an “Oh, no, will we be billed for this leak?” He assured me no, because it hadn’t reached the meter. Unfortunately, though, every ounce was treated water gone to waste. Treating water costs money, no matter who pays it. When our curb stop was broken and the water flowed underground, our small front lawn became very, very muddy. If I lived in a drought stricken area, I’d be wise to not even have a lawn. A green grass lawn uses a lot of water just for basic maintenance. If I’m to draw conclusions from this rambling, I guess I shouldn’t be feeling too smug about my own water conservation efforts, but I should keep doing what I’m doing. If I can expand those efforts, that might be even better. Amigo and I were home. Chuck, lucky guy, was at work and didn’t have to deal with the immediate effects of having no water. Call me paranoid (and you might have a stroke of truth there), but I prepared in advance. 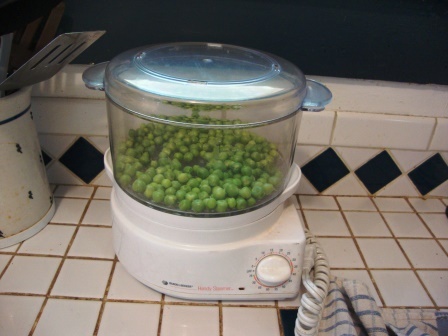 I knew I wanted to cook fresh vegetables in the steamer for supper, so I filled the steamer with water before lunch. 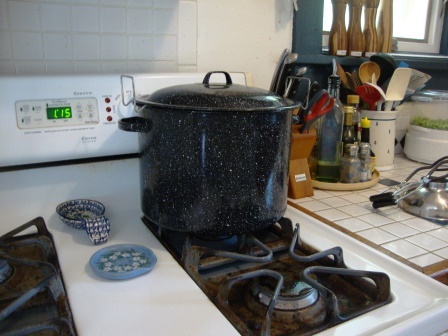 I was planning to make raspberry jam that evening, so I filled the hot water bath canner in advance, too. I had rice on the menu for supper, too, so I chose a soup stock for cooking the brown & wild rice mix. I achieved my goal: I was ready to cook supper, whether the water guys were finished or not. This helped with my second goal: keeping both myself and Amigo calm. Since I had everything I needed for cooking and we had enough water in the toilet tanks that we could, ahem, use the facilities, all was well. Be Prepared; it’s not limited to Scouts. It works for parents, too. 2013: For me, the word was Survival. My episode that resembled a stroke happened in late 2012, but I spent a great deal of 2013 recovering. Physical therapy, walking with a cane, gradually and slowly reconnecting the left side of my body to my brain. An Ice storm left us without power for a day; we stayed warm with a fireplace and charged our phones in the minivan. I was hired to teach summer school, then told “Oops, not really, you’re just on deck” — twice. My home office was ready. The neighborhood became Tornado Alley in early August. Minivan sprouted a cracked windshield; the repair was complicated. ‘Nuff said. “Chuck” took a turn in the ER with a kidney stone and the accompanying pain. The retina in my left eye began detaching, calling for emergency surgery. Choosing a word for 2014 is harder. I picked one on an impulse, of course. We’ll look toward the future – tomorrow. If I use a strawberry dump cake recipe but replace the strawberries with blueberries, cherries, and a diced peach, what should I call it? When the rain barrels are full and there’s more rain coming, should I put out buckets to save even more rain water? If I water a strawberry plant with the leftover liquid in my coffee cup, will the strawberries have caffeine? Is there such a thing as a decaf berry? Why is the city-planted grass in the terrace playing host to more weeds than grasses? How much of the terrace should I actually weed, given that we’re going to have our service sidewalk replaced and a new baby tree planted and more people digging in the terrace dirt? Health and circumstances have cut into my time and energy. Does anyone really mind the weeds? Will the city crews avoid the water and gas lines this time? Don’t. Even. Think. About it. Why does Krumpet the bunny get so worked up when I’m grinding herbs in my mortar and pestle? Why is Sadie the bunny shedding – in July? When should I schedule our garage sale? We have plenty of good things to sell, and the little collectible junk will make people happy, too. And why has Grandma Daisy been so quiet lately? There’s plenty going on, and I’m sure she has opinions on just about everything coming out of Madison and Washington, among other places. I’ve been shredding mountains of papers, including foothills of ancient tax records, aged bankbooks from when banks used actual passbooks, receipts for various long-ago purchases. the hospital statement from Amigo’s birth. He was a bald baby boy back then! another prescription from the same doctor, this time suggesting a leave of absence for fatigue and gastritis. This doctor would eventually put the pieces together and diagnose my first depression. Amigo’s early health statements, decorated with handwritten notes about where to go and what to do next. Those colorful coated paper clips really do last a long time. Ordinary paper clips do eventually rust. A single staple might go through a paper shredder, but multiple staples can cause jamming. Did I really choose these checks with a teddy bear pattern? Did Chuck grimace every time he wrote one? I shopped at Wal-Mart? These are old, old, old check records. My handwriting was certainly neat back then. What happened? The insurance company we had back then put us through the wringer. Did they train their customer service people to be rude, or were they naturally nasty? But those are stories for another time, in another venue. Meanwhile, back at the ranch, the homestead known as the O.K. Chorale, I just keep shredding, shredding, shredding. We took a tangent on the basement clean-up. The major cleaners will be here Tuesday to clean up the silt and dirt from the water disaster. Then they’ll set up professional size fans and dehumidifiers and leave them running to dry the walls. If the walls could talk right now, I’m sure they’d be asking for dry clothes and a little dry weather, too. Chuck unearthed two aging file cabinets – full file cabinets. He went through them and sorted the contents into recycling and shredding. 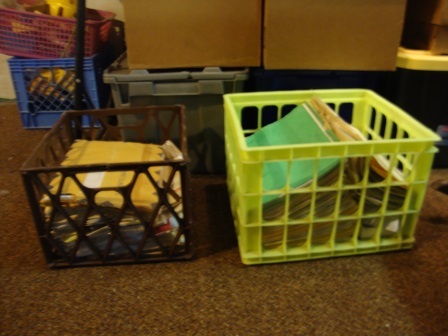 The shred crates are rather full. By the process of estimation (actually from experience feeding pages of old tax returns through the shredder), I’ve determined that one grocery bag of shred equals about three full files. Look at the above crate again. Then look below. I leave a little space at the top so I can staple the bag shut. That way, my shredded old resumes won’t be flying around the neighborhood when the truck picks up and dumps the big blue bin. I’ve already tossed three grocery bags of shred into the bin. We have many more to go. What do you think, peoples? 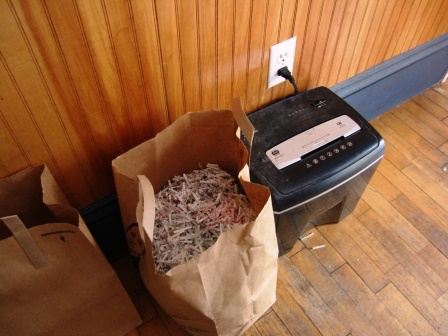 Are there other uses for shredded paper? Before I start sneaking bags of paper into my neighbor’s bins, leave me a note with an idea or two. Honey, can we go solar now? If we could free ourselves from the dependence on natural gas, leaks like the last one wouldn’t be nearly as likely. The problem is, natural gas works so well for us. I prefer cooking on a gas stove rather than an electric. A gas clothes dryer is more energy-efficient than electric. The ultimate solar dryer, the clothesline, isn’t workable for our home. Chuck and I have too many environmental allergies to make it practical to dry clothes or sheets outdoors. Neighbors and acquaintances with wood burning stoves and heaters speak highly of them. Our fireplace isn’t located centrally enough to be converted to heat for the whole house, so I guess that’s out. 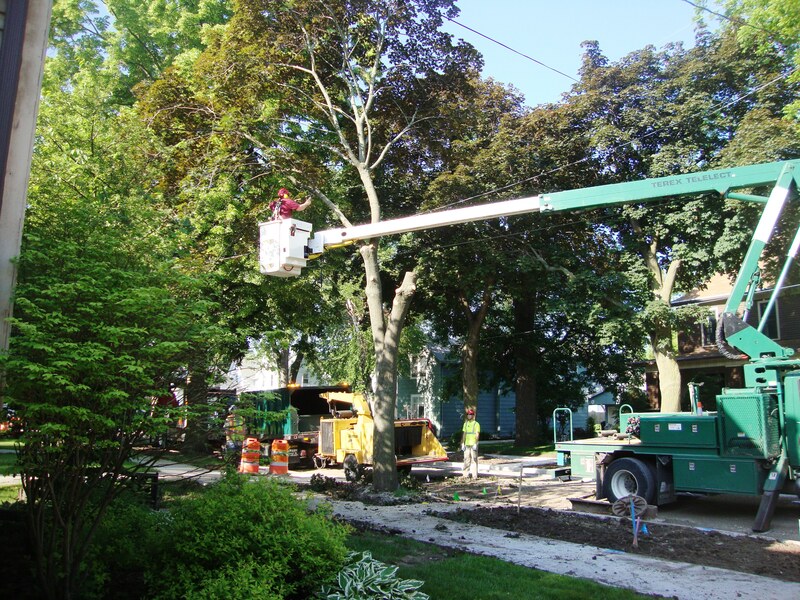 And then again, I must remind myself that the gas main break wasn’t the direct result of a natural gas problem – rather, it stemmed from the repair of the water supply pipe, which was broken by part of the crew working on remaking our street and sidewalks. Honey, maybe we should move to the country where we won’t have to worry about frequent road construction. That might work. The water dept. dudes made a few more calls, and then they called the guys in the diggers back to dig a hole large enough for them to get down in it and finally fix the water pipes. And then, my friends, all hell broke loose. I’m not exaggerating. I discovered the basement had water on the floor, so I passed that information on to Chuck. He and a water department dude went downstairs to see the mess, and I retired to the kitchen to once again attempt cooking supper. This could have been disaster, I later realized. Cooking over an open flame on the gas stove when – you guessed it. Or did you? Chuck came upstairs followed by the water dude and announced a gas leak. Quickly – no, immediately – no, instinctively – no, automatically – ANYWAY right away, I turned off the burner. Serious? Dangerous? You bet. We stopped on a neighbor’s porch to put shoes on and both Water Dudes yelled at us to get farther away. We did. We ran, almost dragging each other, to the side street where our cars were parked. We headed to the Safe House, a.k.a. Petunia’s apartment. Let’s look at the ingredients so far. Gas. Not the kind that makes boys giggle, but the kind that can blow up houses. Now I know what writers mean when they talk about people being evacuated with just the clothes on their backs. We were lucky; I had my purse, with my phone in it, and our meds. Amigo had shoes and his white cane. Chuck had his car keys. I didn’t have mine, so we piled into his vehicle. It’s almost as though the story didn’t end there; it had just begun. Next? Settle. Eat a little. Drink fluids. Eventually, find a hotel (courtesy of our insurance company) and (sort of) sleep. No, it wasn’t that simple. Not a chance. Bad: It’s several days after the disaster, and we’re still running fans to help dry out the standing water in the basement. Good: The fans are working. We have several. Ugly: The damp stains left behind and their suggestion of damage to the foundation. Good, Bad, and Ugly: We’ve decided to handle the clean-up ourselves rather than hiring a cleaning service. Good: Chuck made several phone calls to city folk and construction crews, and he actually talked to real people, not voice mail. 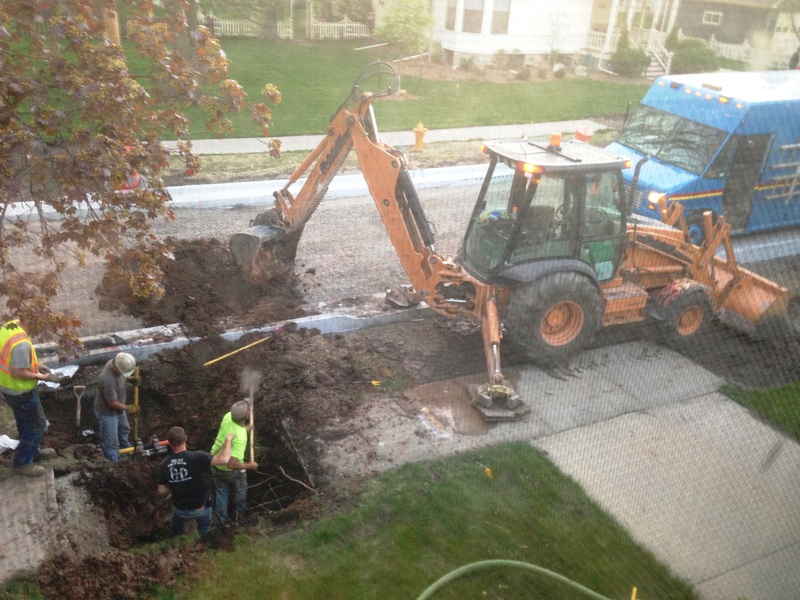 Bad: The construction guys who broke the water main lied about how they handled the situation. Professional? Not. Ugly: There are more phone calls left to make. Good: the water pressure in the laundry seems okay. Bad: The laundry still needs to be done, no matter what else is happening in life. Ugly: There are more dirty jeans and t-shirts and rags and towels due to the clean-up. Bad: the water pressure in the upstairs bathroom is weak. Good: the water pressure in the first floor bathroom is fine. Ugly: this calls for another set of phone calls and a visit from the plumber. Bad: We still can’t use our driveway or garage due to construction. Good: That leaves us space in the garage to store basement items while we await another visit from the adjuster or the foundation expert. Ugly: We still can’t use our driveway or garage due to construction. Good: My Crocs, those ugly yet perfect gardening shoes, are also perfect for wandering through the waterlogged basement. Bad: The multitude of boxes on the floor soaked up water. Good: Many boxes, set aside for recent moving adventures, were empty.